Surfshark VPN makes the subject of this review, as it’s a VPN provider whose popularity just keeps on growing lately. At first sight, you might not be impressed by its presentation, but the truth is that you should never judge a book by its covers. Not entirely, that is. In the next following paragraphs, we will try and get behind the curtains to show you exactly the reason for its rising popularity and check whether or not it can be a suitable VPN provider for you: one that you can trust your data with and that doesn’t slack on speed, either. For instance, they clearly state that they’re located in the British Virgin Islands (BVI), which is a good thing. The BVI has no mandatory data retention law; therefore, Surfshark can’t be forced to store various logs regarding any kinds of activities whatsoever, which turns it into a desirable location for a VPN provider. As before, the background check is mandatory here at FindYourVPN. The reason why we make ourselves dig around looking for these bits of data is that we want to offer you the real, 100% transparent VPN reviewing experience and not push you towards one provider or another. What you see is what you get. However, this component of our reviews is sometimes very rudimentary, since some of the VPN service providers (Surfshark is now one of them) doesn’t give us much in terms of “who we are” or “who runs this.” That’s why we have to continue our research and, instead of giving up, we can focus on things that matter most. If you’re curious about reading it yourself, you can notice that, from the beginning, you are informed about the fact that your privacy will be respected, shall you decide to do business with Surfshark. I mean if you decide to use it as your VPN provider. The company continues this statement by letting you know that they’re committed not to process any data regarding their users’ entire online activity. Although most VPN providers say that “privacy is important” and other stuff to get you hooked, some of them will gladly sell your data to the highest bidder if the need arises. Of course, in order to use any premium service in this world, you must give up a bunch of info, which they do collect and process. However, this type of data is also used for any other type of transaction you’d make online, so you really have nothing to worry about. The kind of details we’re talking about, which are required and collected upon signup are your e-mail address and your encrypted password (needed for account management, customer service, as well as product and Service marketing), as well as basic billing information and order history. Even so, the billing information that is collected is kept to a minimum, so as to not feel too intrusive to the end user. Such data includes the payment amount, the currency you used to purchase their services and the date of the payment. The order history is only there for order processing and for respecting some legal requirements that might apply. Although VPNs are often deemed as being the epitome of online security and anonymity, not many VPN providers hire a third-party security company to perform an independent security audit on their services. And if they do, seldom do they admit or post the results online. That’s not the case with Surfshark, who bravely put their services on the chopping block, believing that their VPN was leakproof. And they were right! A bunch of fragments from the report also indicate the fact that the extensions were not entirely clean, but a couple of vulnerabilities (low severity ones) were detected. However, according to Cure53, only one of them is an actual vulnerability and not even related to the extension itself, while the other one is regarded as being a general weakness. Nowadays, security should be a great concern that should affect not only professional users who are constantly connected to the Internet, but especially novices as well, since they are more exposed to various threats that might jeopardize their privacy and well-being as well. Lately, the press has been overflowing with scandals regarding leaks of information, which are generally frowned upon, regardless of who might be subjected to such violations of privacy. These scandals didn’t bring anything good to the VPN market since most users grew more and more distrustful of the services they have to offer. In an attempt to stabilize the market, some VPN providers might choose to prove the fact that they are true to their creed, and currently, there’s no better way of showcasing their innocence to the general public. The audits take the good, the bad and they raise it in front of the public. No marketing schemes. Only the naked truth. As you probably figured out on your own by now, Surfshark is a VPN provider, which means that it is capable of keeping your online identity anonymous while also providing your Internet connection with a boost of both accessibility and overall increased security. The name choice is an interesting one, hinting that if you use its services, you’ll be able to surf the world wide web like a shark: silent, undetected and quick. The presentation of this VPN boasts a bunch of features you’ll be able to benefit from unrestricted content (one of the main reasons people use VPNs nowadays), ultra-fast speed (to be disclosed), CleanWeb (no ads, trackers or malware), a killswitch (we’ll get there soon) as well as several other ones. We call them extra or additional features, although it’s not exactly uncommon for a VPN service to have added security controls in order to prevent your online privacy from being invaded. 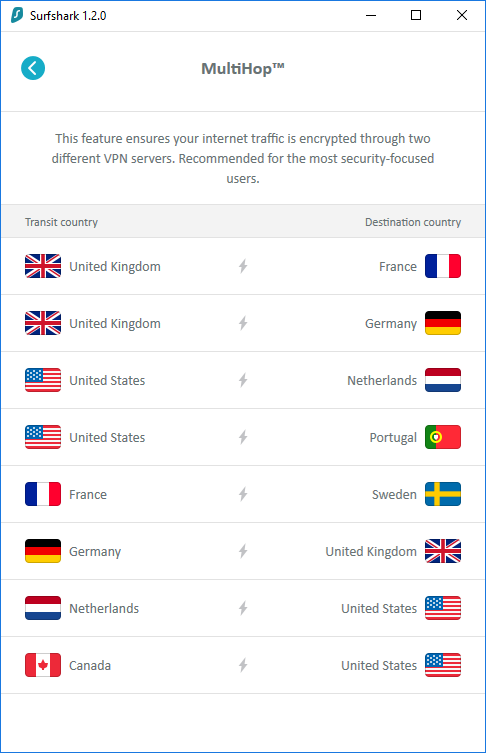 However, these functions greatly complement the basic features of any VPN service provider, and Surfshark doesn’t shy away from just handing them out to its users. In our opinion, the killswitch is the first and foremost feature that needs to be mentioned in this discussion. 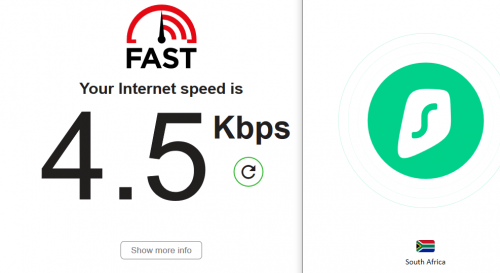 The importance of this tool lies in its capability of instantly killing your Internet connection in case you disconnect from the VPN. This way, your online activities remain strictly bound to the server you’ve connected to instead of being exposed. The “MultiHop” feature “hops” your connection, thus making it harder for anyone to discover your actual identity. The “CleanWeb” mostly speaks for itself, as it provides you with a “clean” browsing experience, eliminating ads, malware, and trackers in the process. Among the list of features, you will also find IP masking, which spoofs your IP address, making it impossible for anyone to trace it back to you by using standard IP detection measures, private DNS on every server that eliminates potential security issues and also privacy over public WiFi connections. Given that most of the VPN users nowadays have a Windows computer, we’re just going to talk about deploying this application on a Windows-enabled PC. Although the process might not be complicated on other supported devices, it can be awfully specific. But, before rolling our sleeves and getting our hands dirty, it’s time to tell you something really big. Surfshark enables you to use its VPN services on an unlimited number of devices. That means that you and your family members can use the same account on how many devices you like, there is no limit. Basically, you can use Surfshark on any kind of device as long as it falls in the next categories: Android, iOS, Windows, macOS, Linux, Amazon Fire TV, Router, Chrome, and Firefox. Well, the last two aren’t exactly devices, but it is possible to use Surfshark’s services on these two browsers by installing their dedicated extensions. 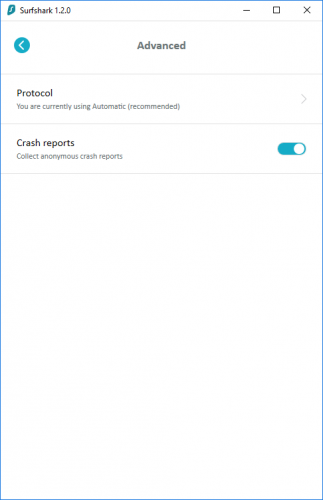 It is also possible to use it on other devices by making use of the “Manual config” option on their website, that can be accessed from the “Apps” menu. Retrieving the Surfshark applications on your devices of choice can be accomplished without too much of an effort, since all the download links are highly accessible, even for inexperienced users. First thing first, heads to this page and purchase a subscription plan. Once you’ve landed on their homepage, notice that at the top of the screen you can find a “toolbar” of some kind that encompasses several sections. The “Apps” section is actually a combo menu that allows you to pick your favorite device before proceeding towards the download process itself. It’s possible to download the Surfshark app for macOS devices, Windows and Linux computers, iOS and Android phones and tablets, Chrome and Firefox browsers, as well as Amazon Fire TVs from this category. Each device can have a different download mode, ranging from providing you with a direct link to the installation package or a Google Play / App Store address to letting you download an APK file and placing it on your device manually. 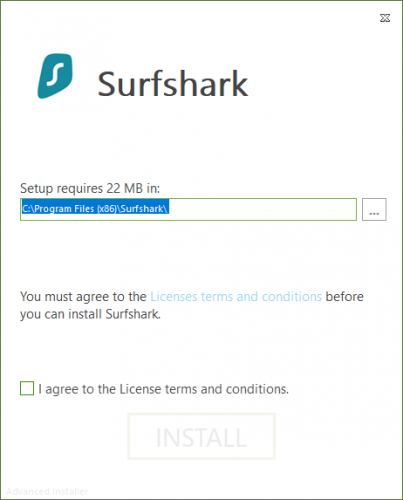 The best part is that it’s not required from you to register for a Surfshark account, or even paying for a subscription before being able to access these installation files from your device. That being said, some users might prefer apps that can be retrieved in an easier fashion to those that are harder to identify on the developer’s website. If, however, you decide to register for an account, you’ll be able to access a page where you can perform various account management operations, which is commonly known as the dashboard. 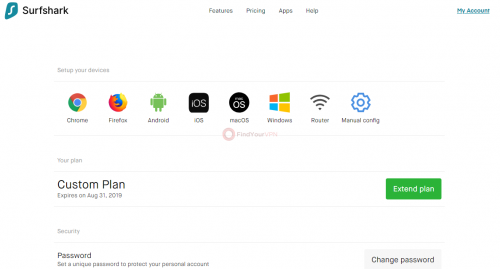 Surfshark’s dashboard doesn’t hold a lot of account operations, but you can still do a bunch of stuff such as extending your plan, changing your password and setting up your devices. You can choose from Windows, MacOS, iOS, Android, and router devices, and Chrome and Firefox browsers, but you can also select the “Manual Config” option in case you want to perform a manual setup on a device that’s not listed on the website or doesn’t have native VPN app support. Okay, now that we’ve covered what kind of devices you can use with this VPN provider, it’s time to see how well it behaves when we try installing it on our old, trusted laptop (not that old, but not entirely new, either). Basically, the setup process is simple enough that it can be accomplished even by users who lack even the most basic computer operation skills or ones who have no previous experience with handling similar programs. 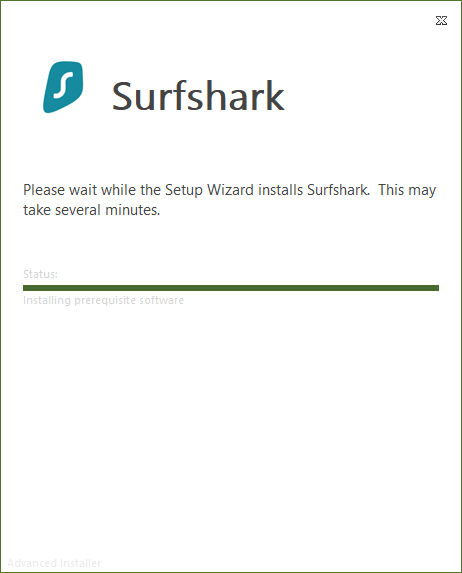 The version of Surfshark that was deployed on our computer is 1.2.2. The reason why it’s so simple to install Surfshark is that it doesn’t require you to perform any additional configuration or take any complicated steps during the setup. You just need to decide where will it be deployed and send this info to the installer by first accepting the End User License Agreement and then hitting the large “Install” button. The setup process unfolds automatically, without requiring any additional assistance on your side. Not even the pre-requisite TAP driver needs to be installed by you; everything is being taken care of. At the end, you can just finish the setup process or run the app directly from the installer window. Once you’ve installed it on your PC, it’s time to run it and see what it’s capable of. Its main window showcases some of its highlight features, which you can easily explore by using the little arrow buttons. Alternatively, you can just log into your account and start protecting your online privacy. After you log in, you’ll be proudly notified that Surfshark enables you to use it from an unlimited number of devices. At this point, not many other VPN providers offer you this kind of service (none at all). So, you’re in front of the main window and a bunch of buttons greets you: the gear-shaped button at the top of the window, the “Quick Connect” one and, last, but not least, the “All locations” one in the bottom part of the window. That’s it. Either let it connect to the recommended location by using the “Quick Connect” feature or choose your favorite server from the list, the choice is yours and they’re both equally easy to access. We’ve mentioned the MultiHop feature above but didn’t talk too much about it, because, since it’s a unique feature, we wanted to dedicate it a full subchapter in our review. 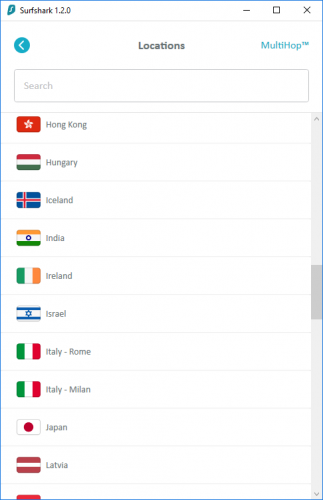 The principle behind this feature is that it can provide you with better, more improved privacy by routing your whole online activity through two different VPN servers. Using this tool is highly recommended for users who look for enhanced security rather than speed. In order to access this feature, all you have to do is open the “All Locations” menu, which will bring you to a list of every server that’s managed by Surfshark. In the same window, you’ll notice that the MultiHop tool can be accessed. Using it requires you to choose a configuration of transit countries (located on the left side of the screen) and destination ones (on the right). The application does the rest to keep you safe. Although a wide range of possibilities often equals a higher quality, we think that sometimes minimalistic approaches can have a greater effect. In this case, Surfshark’s main window is the object of our study. As you can notice, the main screen only features three simple, easy to understand controls and the configuration menu is not that complicated, either. The fact that its features are user-friendly turns Surfshark into a software solution that is suitable for novices and more advanced users alike. If you like to tamper with the settings it’s fine; you can easily do so. And if you’re a more “default” user who prefers leaving things as they are, it’s perfectly fine, too, Surfshark will serve you in the same effective manner in both cases. We’ve talked about the main window, let’s go a little deeper and explore the application’s Settings section. As stated before, accessing it can be done by clicking the gear-shaped button in the main window. After doing so, multiple categories will unfold before your eyes, leaving you to choose what side of Surfshark are you interested in, whether it’s better understanding its capabilities or modifying them all together you’re looking for. Among the categories available in this menu you fill find “Connectivity,” “Notifications,” “Security” and “Advanced.” All of them are self-explanatory, so you don’t need to spend time looking around for what any of them means. 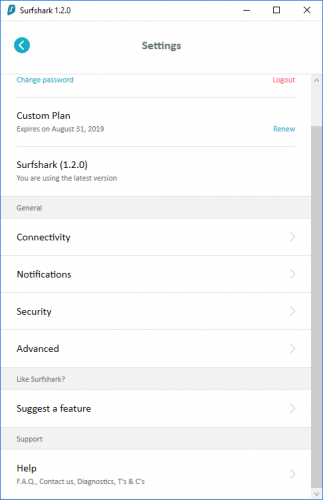 It is also possible that you can renew your plan directly from this menu, suggest a feature and access a F.A.Q., contact the developers and also read the Terms and Conditions of Surfshark. 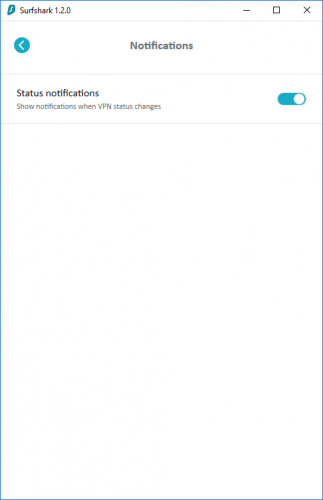 As you’d expect, modifying the settings is also a walk in the park, as most of the tweaking is done by simply toggling a feature on or off or choosing stuff from a list. It doesn’t really get any simpler than that. 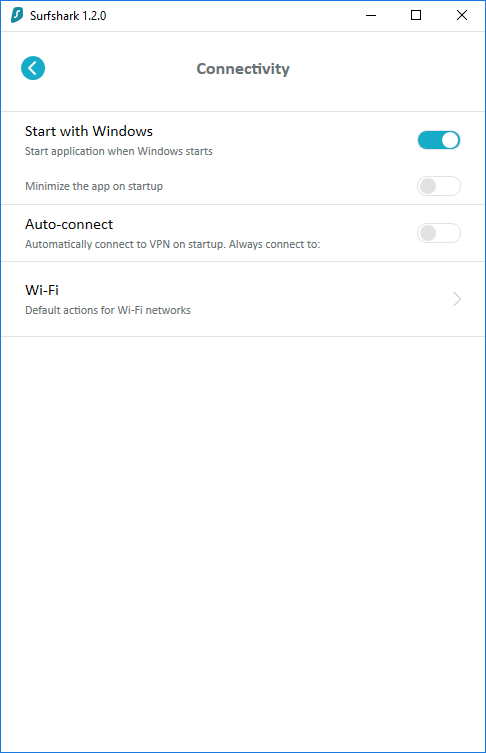 The “Connectivity” tab lets you set the app to start at the same time with Windows and minimize the app on startup, automatically connect to VPN on startup by picking a favorite server and pick default actions for WiFi networks. The “Notifications” category lets you enable or disable notifications as you wish. 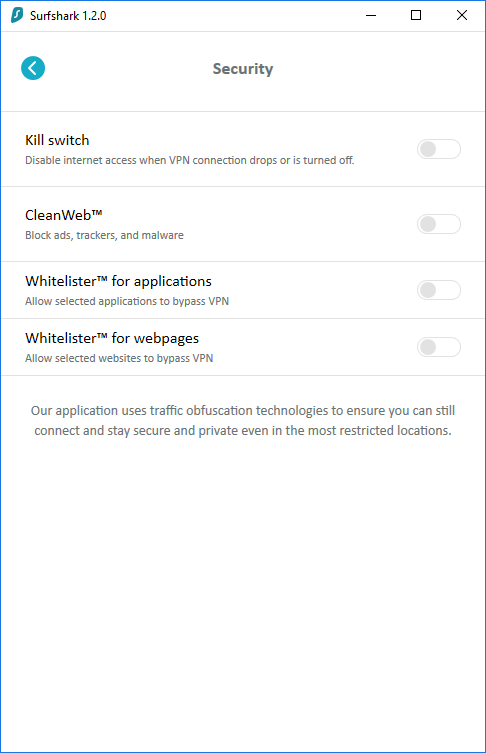 From the “Security” tab you can activate the killswitch (we strongly advise that you do), enable the CleanWeb service, enable an app Whitelister and toggle a Whitelister for webpages. The last two features enable certain apps or webpages to bypass the VPN. 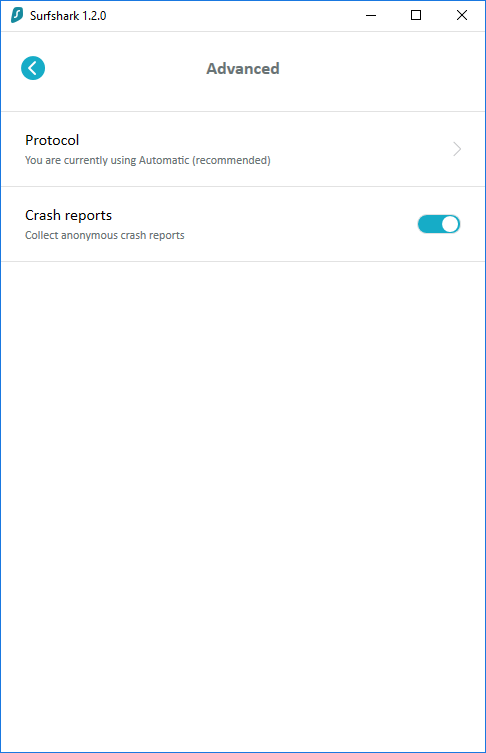 Last, but not least, the “Advanced” section, which should be the most intimidating, only lets you toggle crash reports and choosing your favorite protocol between “Automatic,” OpenVPN/UDP, OpenVPN/TCP, and IKEv2. The size of this list may not be impressive, but Surfshark does a good job covering some of the most important areas worldwide and, the most important aspect, it is constantly expanding its server network. Surfshark has more than 500 servers located in 50 different countries. One of the most popular uses of a VPN service provider is for unlocking contents that are otherwise unavailable. Some services haven’t reached certain countries yet, so it must feel somewhat frustrating not to be able to use it, even though you’re willing to pay good money for its features. However, using a VPN such as Surfshark can take care of these issues for you so that you can stream various TV series that you like, watch movies or sports events, play games with your friends and listen to music from multiple services. Aside from the popular streaming services, Surfshark is also capable of unlocking social media services such as Facebook, Twitter, Twitch, vk.com, Google+, Instagram, Snapchat, Kik, Telegram and more. As you probably got used by now, we will provide Surfshark with the same kind of treatment we offer to any other VPN provider that gets within our reach: testing its security capabilities and deciding whether or not its connection speed values are as high as they claim. In order to perform these trials, we need a couple of tools, which we have used, currently, use and will keep using for all the VPN service providers, so that the results can be compared to one another in a fair and square manner. We consider that having a secure VPN is more important than a fast one since the purpose of such software solutions is to protect your online privacy and potentially unlock some services that are otherwise unavailable. If you’re only looking at speed when picking a VPN, you probably shouldn’t be using one in the first place. The tools we’re going to use for determining whether your service is safe and fast are the IPX website security analyzer and the fast.com service provided by Netflix since we’ve noticed that it gives accurate readings about your connection speed. If you are losing your patience and would like to have a look for yourself rather than listen to us ramble about whether these results are satisfactory or not, here‘s the address where you can view them. As always, we highly encourage that you install the application and run the tests for yourselves. This way, you can convince yourself of our test results’ authenticity and see that we’re not biased in any way. Our IP address was successfully replaced by the one provided by the server and our location was spoofed, so that we are now located in Amsterdam, Netherlands. Although we have chosen “Germany” as our target server, we believe that it’s not really a big issue that our tests showed us someplace different, especially when the ISP and ASN values were changed to German ones. The IPv6 geolocation information was not available, which is a good thing since IPv6 leaks are a common issue with VPN users. Our DNS was also spoofed and assigned to a server in the Netherlands and our WebRTC (public and private) values were successfully masked. Overall, we are extremely satisfied with the security test results of Surfshark, since no vital information was disclosed with the testing tool. When doing our speed tests, we try not to judge the VPN provider by trying out only one of its servers. Instead, we choose multiple ones and test the speed values for each one of them. Usually, we pick servers from different regions, ones that are somewhat far from one another, so we can observe how distance plays a role in this scenario, as well. South Africa – 4.5 Kbps. As you can see, the speed isn’t incredibly high, but what surprised us most was that in areas where other VPN providers have trouble even maintaining a stable connection, let alone reach decent speed values, Surfshark pulled off some impressive numbers. Kudos to that! 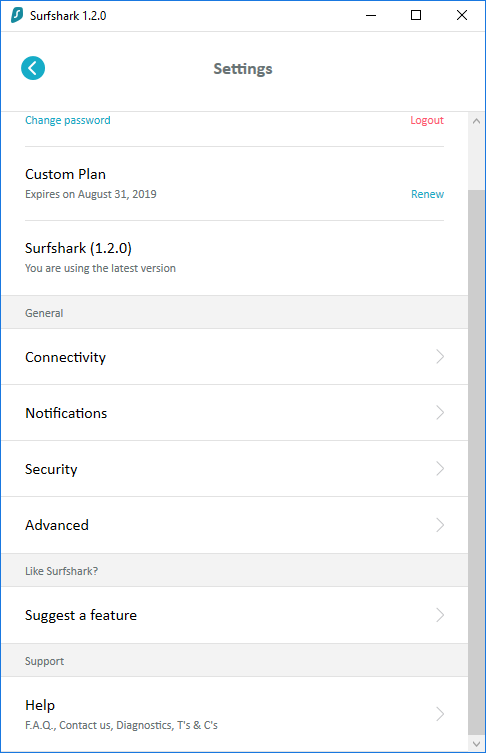 Surfshark doesn’t feature a trial version, but that’s not an actual issue since almost no VPN service does offer it to begin with. What you need to understand is that the need of removing trial periods usually arises from various attempts to trick the systems (e.g. signing up for multiple trials and evading actually paying for the service). However, if you are honestly worried about not liking the service after paying for a subscription plan, Surfshark has got you covered. You can benefit from a 30-day money-back guarantee, so that, no matter what happens in those 30 days, if you are not 100% convinced that Surfshark is for you, yor money will be refunded. In our opinion, the price isn’t high at all, considering that you can install the application on as many devices as you want. You can even ask your family to chip in for a 24-month plan, install the application on each one of your devices and nobody will bat an eye. 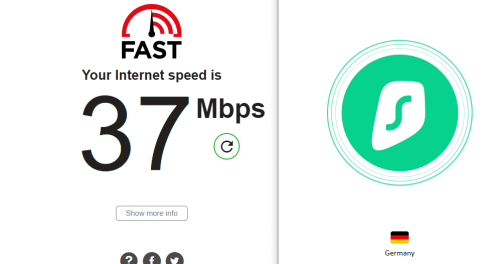 Sure, the list of servers you can connect to might feel somewhat limited, but on the bright side, you get pretty decent speeds even for servers that are located in more remote areas. 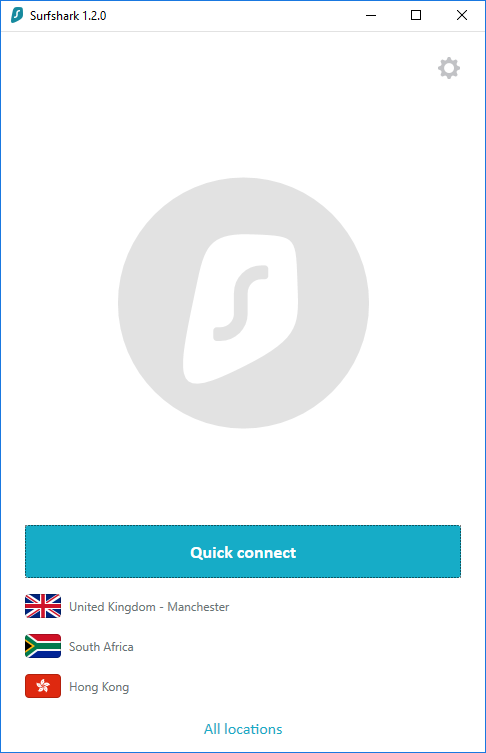 If you, for one reason or another, need extra support with operating the application, or installing it, or just encounter an issue that you can’t solve at the moment, you can safely rely on Surfshark’s customer support service. In order to access it, you just need to click the suggestive “Help” button on their website, which will bring you to a page where you can choose between the various forms of help documentation before actually contacting them in person. The pages you can rely on are “General Help,” “FAQ,” “Setup Guides,” “Billing,” “Account” and “Technical,” each of which is very suggestive regarding the topics it covers. If you can’t solve your problems by using the guides alone, just click the “Chat” button wherever in the website or the “Live Chat” one that pops up in the “Help” page. The former lets you send a ticket-like message that will be analyzed and solved whenever possible, while the live chat lets you receive a live response regarding your issues. It can be easily installed on the target computer, enables you to use its services on as many devices as possible after purchasing a plan, can be configured without any efforts and provide you with multiple unique features. Its list of servers might not feel like something big right now (compared to other similar services), but they cover most of the important regions worldwide and its subscription plans are highly convenient, considering what they’re offering the end users. Surfshark receives a 4.14/5 rating.